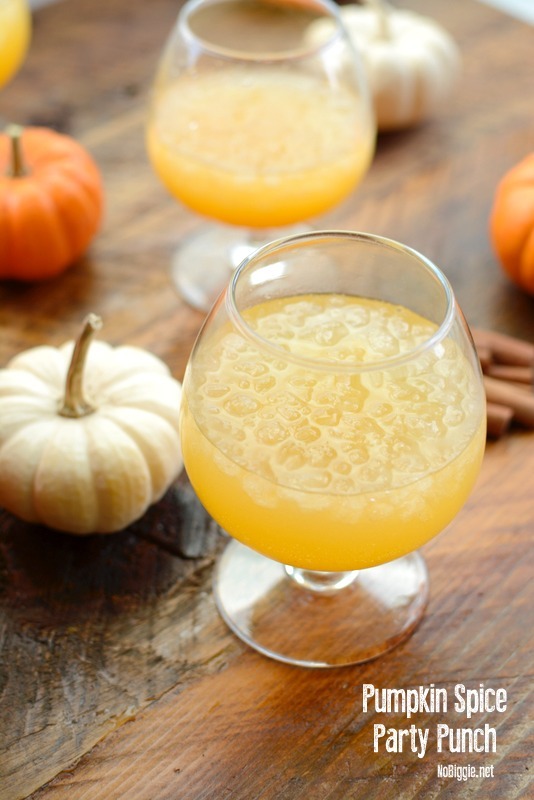 Serve up a this sparkling non alcoholic Pumpkin Spice Punch in a PUMPKIN! Add dry ice for a spooky effect! 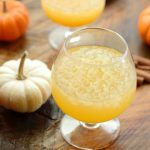 Whether you have a Halloween party in the works or a festive Fall day at the Pumpkin Patch, this sparkling Pumpkin Spice Punch will be the perfect drink to serve a crowd. The fun part is watching the dry ice vapors spill over the top of the real pumpkin you serve it in. Watch the video to see this festive fall drink come together! When you make this punch, your house will smell like Fall. All the pumpkin spices simmering together on the stove as you make the syrup for the punch will make your house smell heavenly! The taste of this punch is similar to like a hot wassail, only this punch is served chilled with lots of pebble ice. Pebble ice makes any drink better, don’t you think?! So be sure to pick up a bag (or two if you have the freezer space) at Sonic Drive Thru or your local Grocery Store might sell it by the bag too. Serving punch inside of a real pumpkin can be a little tricky. You’ll need a glass bowl that can fit inside. We used a glass pyrex dish with a flat bottom and sides that are straight up and down. You’ll also want a metal bowl under the glass bowl that can safely handle and hold the dry ice. I found that a cheap metal pie tin that can be bent and shaped to fit inside the bottom of the pumpkin worked great. It was also great at keeping the glass bowl elevated above the dry ice enough to let the dry ice vapors come out and over the top. 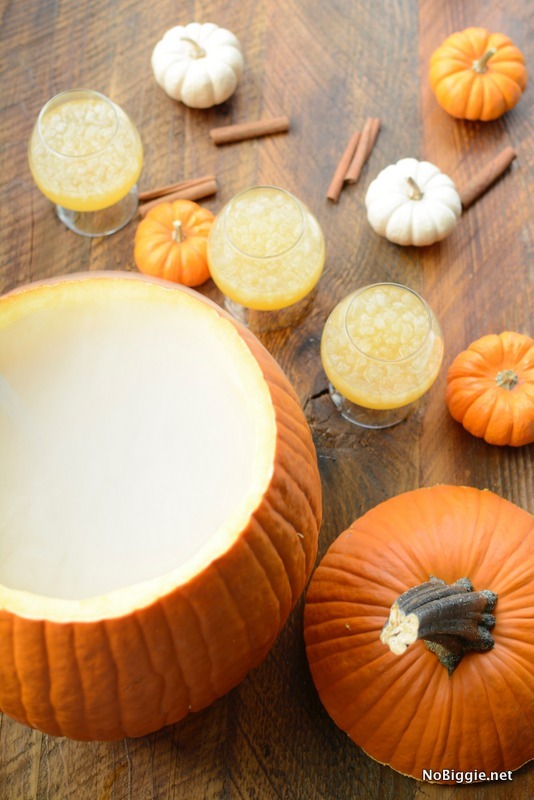 Once your pumpkin is hallow, practice inserting the glass dish into the pumpkin and also taking it out of the pumpkin before you add the punch or the dry ice. Watch our fun video here to see this punch + pumpkin punch bowl in the making. We added this cute Halloween confetti all around for a fun nod to Halloween. Nothing too spooky around here! 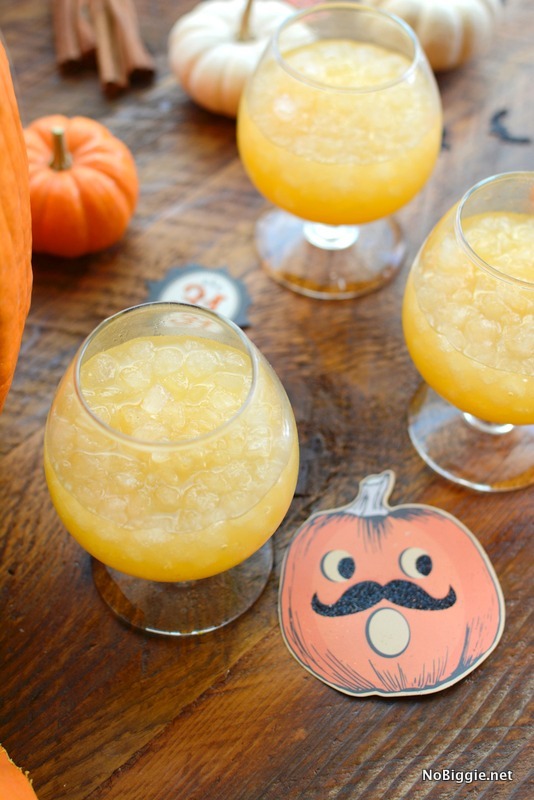 Sparkling Pumpkin Spice Punch is such a fun punch for your Fall and Halloween parties. 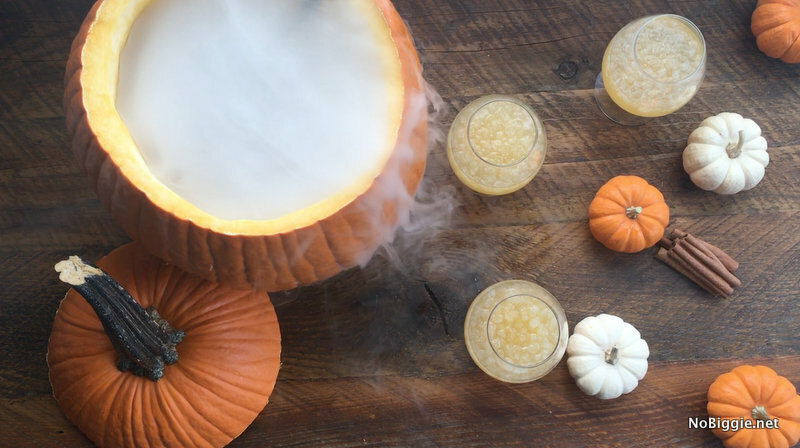 Served in a hallowed out pumpkin with dry ice vapors spilling over. In a sauce pan over medium heat combine the pumpkin puree, orange juice concentrate, sugar, water, lemon juice and pumpkin spice. Bring to a boil stirring constantly. Quickly remove from the heat. Pour mixture through a metal mesh strainer and chill until ready to serve. This pumpkin syrup will make about 2 cups. Once the metal bowl (or pie tin), glass bowl and dry ice are in place inside the hallowed pumpkin, you can now add your punch. Start by adding a few cups of the pebble ice into the glass bowl. Add about 1 cup of the pumpkin spice syrup. Finish by adding the sprite. Grab a big metal ladle to serve the punch. Now for the dry ice party effect, pour a little bit of water into the metal tin, making sure to avoid pouring it into the glass bowl where the punch is. With the added water, the dry ice vapors will begin to grow. 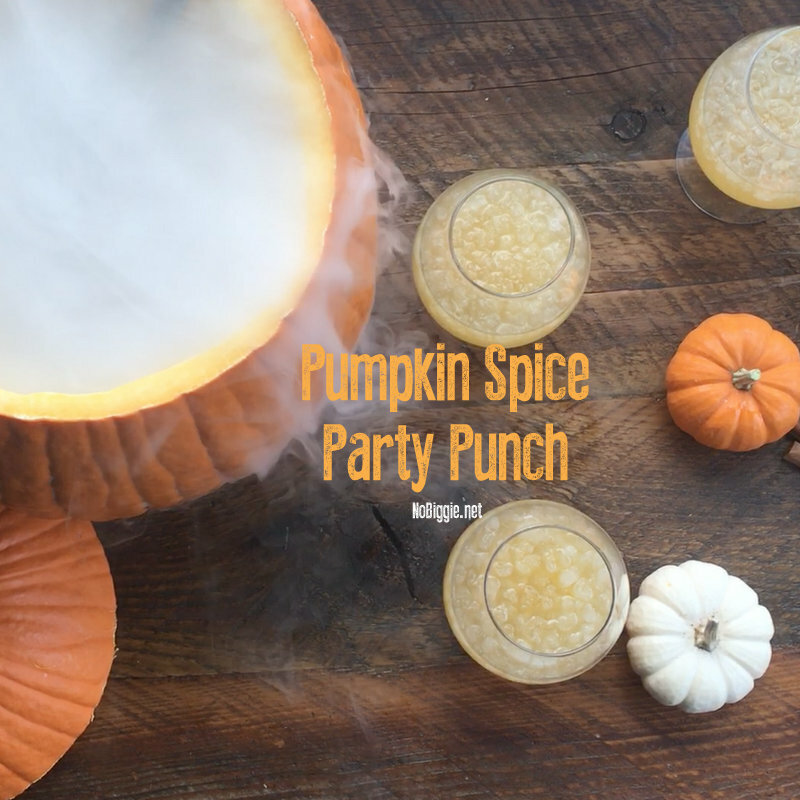 You can replenish the punch as it is consumed by adding more ice, pumpkin syrup and sprite. Keep these three all stored separately. This punch is non-alcoholic, but alcohol can easily be added if desired. So there’s a few things to note about dry ice before you shop for this recipe. A few of these things I didn’t know, and you can learn from my mistakes! -Dry ice needs to be used hours after being purchased. I mistakenly thought I could buy it days before we used it for this recipe and when I was ready to use it, it had disappeared! I was left with an empty paper bag. -Dry ice should not be stored in your fridge or freezer…the gases released can ruin your fridge and freezer and in an extreme case make it explode…true story! So grab one of those cheap insulated styrofoam containers to store the dry ice for a few hours before you are ready to use it. -Dry ice can burn your skin. We knew this one, but it’s one of those things where you wouldn’t think ice could burn you, but it can. Try to avoid handling it directly. Or if you do need to handle it, where insulated gloves. -Store Dry ice in a ventilated area. Don’t leave dry ice in a parked car and keep it outside in an insulated container when at home. -Avoid breathing in the fumes of dry ice. Carbon Dioxide is released from dry ice which can be hazardous to your health. -More info about how to store dry ice here. Here’s another fun DIY project for a Halloween Punch Bowl, if you don’t want to serve the punch in a pumpkin.